Last week I left you in a state of perpetual bated breath and an unquenched thirst for the dining room reveal, right? Well wait no further… grab something to drum with and let the roll begin. I wanted lavender, but a subtle lavender… well it’s not exactly subtle, but… it’s JUST what I envisioned. I didn’t want to waste my time painting all the walls and then have it look white during the day and barely lavender at night. I was going for obvious lavender all the time. And this is, well… you’re not going to miss it. 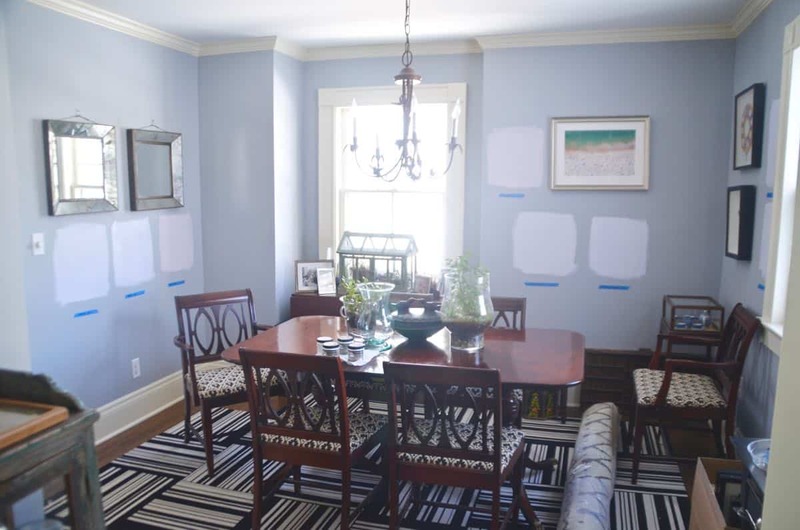 Reminder of how the room used to look…. 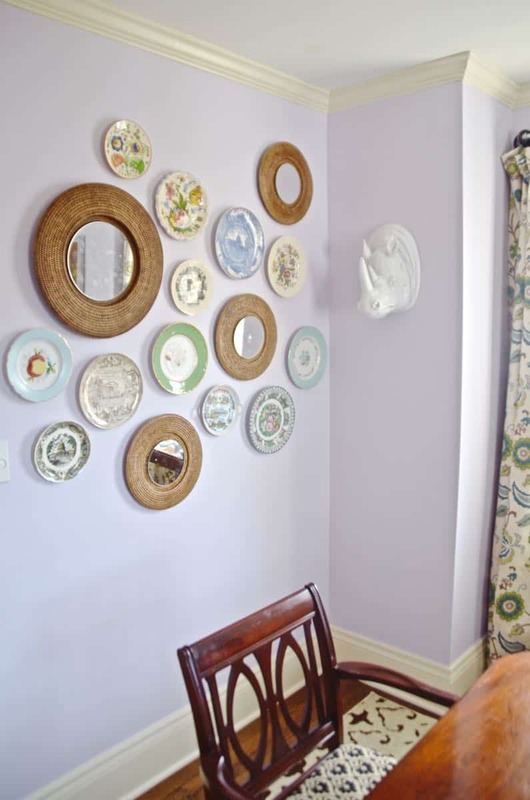 here’s the image from the Home Tour. Gag, right? This fabric is off the hook. I mean, it’s everything. 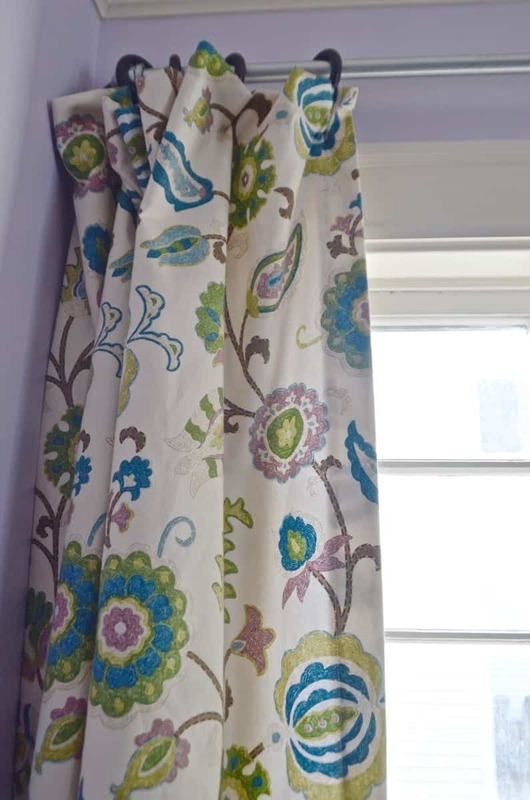 Online Fabric Store provided me with a gift certificate towards these curtains and I am obsessed. The pattern brings everything together and gives some other colors to work with and they’re just boss. 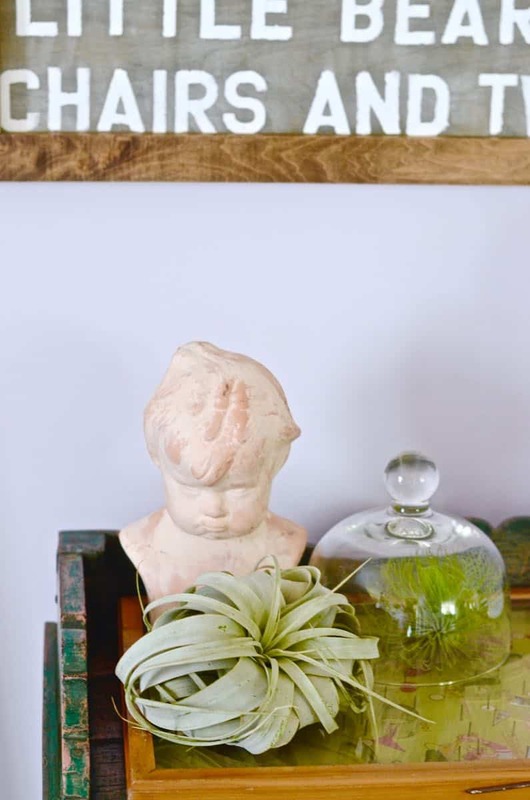 I DIYd these plumbing hardware curtain rods… not original, but something I’ve noticed on other blogs and really liked. And they’re crazytown easy to make. You know what else isn’t original? Ombre. 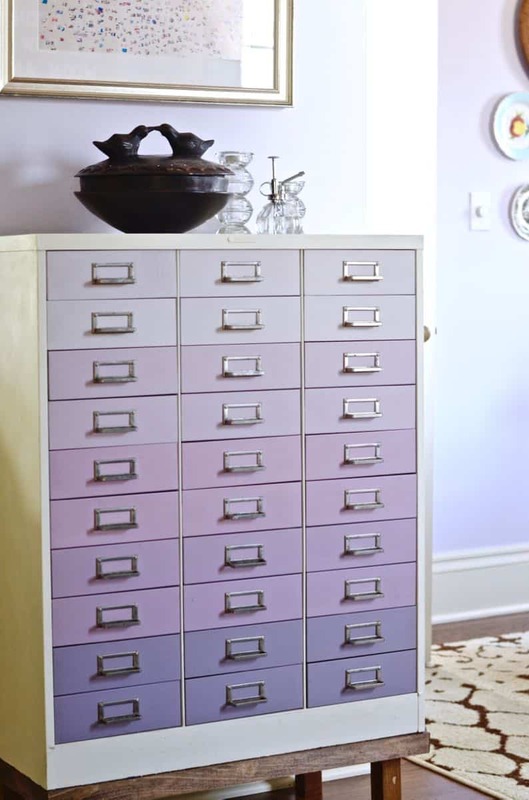 Specifically ombre drawers. I know they’re everywhere, but I just couldn’t stop my copycat brain from insisting on doing these. I tried to think of an original idea, but the ombre won. But… I love it so phhfffft. 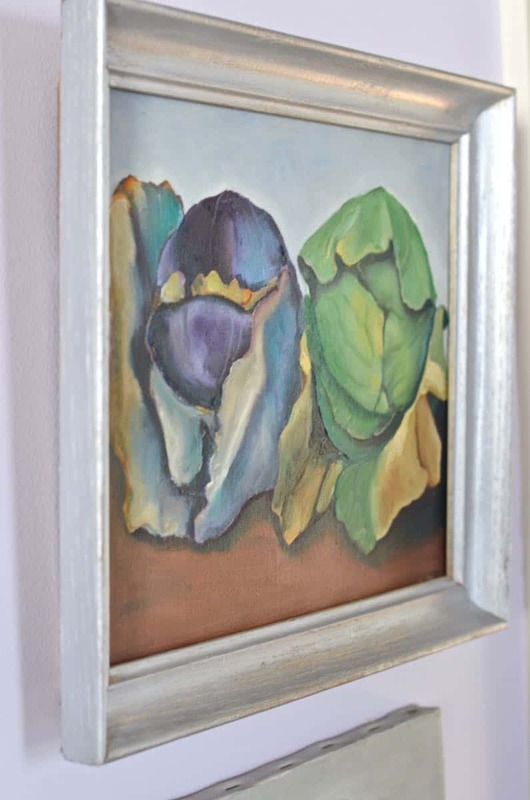 The artwork is flea market for the most part… I was able to find some frames that fit the paintings. And then I went back over the frames with silver rub n buff. 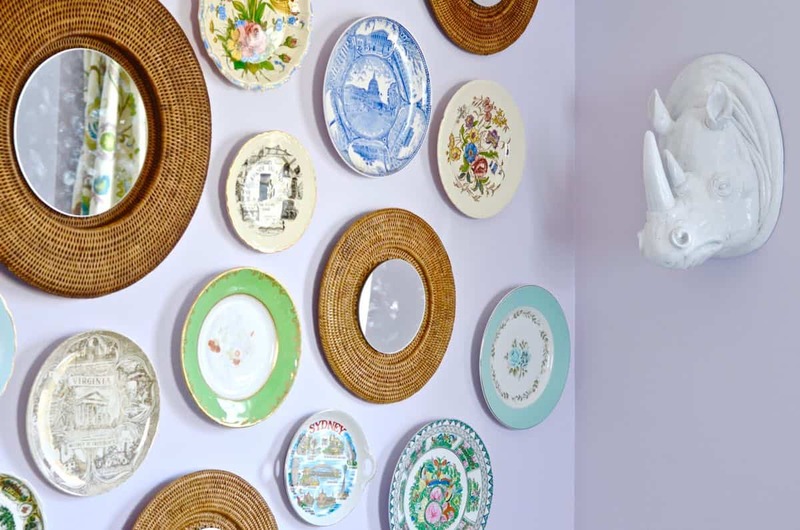 I’ve wanted to do a plate wall for a while, but I’ve struggled to find cool vintage-y plates. What I did find was a bunch of those souvenir plates from places that have meaning to me (D.C., Virginia, Connecticut, Sydney… all places I’ve lived and loved). 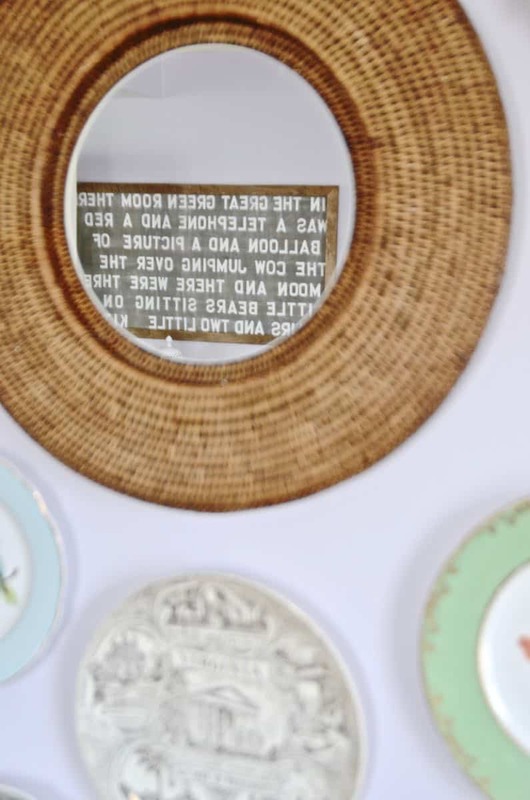 The mirrors are wicker chargers I scored at Goodwill, and the mirrors are actually from Target (but also snagged at Goodwill)… Maybe $15 for everything? I used some wire and some epoxy to adhere the mirrors to the chargers. Did you notice the rug? Well stay tuned for more love for this rug in a post coming soon, but this bad boy was given to me by Mohawk Home Rugs and it’s the answer to this lavender room’s dreams. 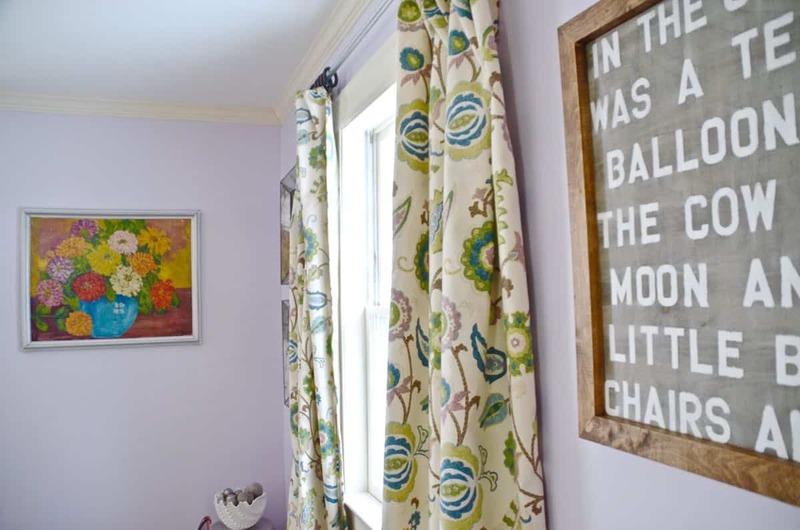 The darker color keeps the room from getting too close to nursery territory (in my opinion) and the bohemian pattern actually pics up the shapes of both the chairs AND the curtains. I mean this room is like the 3 couples from all 93 seasons of the Bachelor who have ended up married and in love. I’ll post step-by-step instructions for these projects over the next few weeks. This space is SO much happier and bright and welcoming. Now I REALLY don’t have an excuse not to entertain. See how I made the stencil art here. See how I made the curtains here. 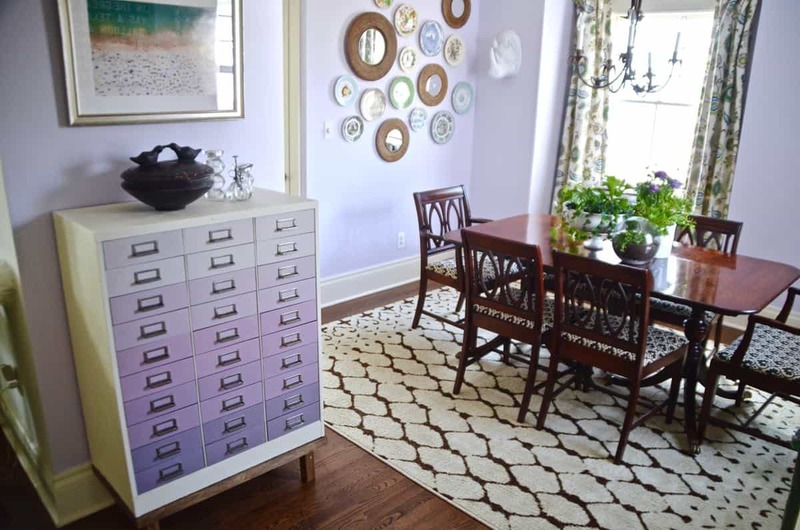 See how I made the ombre file cabinet here. I. Love. It. Seriously, it is beautiful and fun and cool and collected and… Yes. All the things. Great great great job!!!!!!!! Thanks! I wish you could see it in person. 😉 It looks SO much better!!! What time is dinner and what can I bring….FAB! Thanks, Dena! I was worried it would look a little to frumpy… but I’m super pleased with how it came out! Looks wonderful, Char! Can’t wait to see it in person. OK, Obviously I’m catching up on your posts after a couple of weeks hiatus. Not trying to be a comment “stalker.” 🙂 Great job on this room! 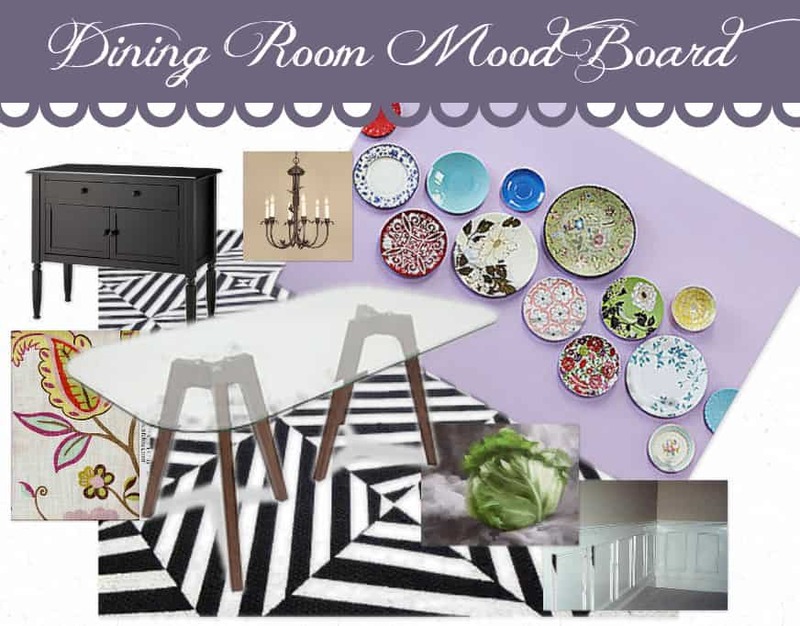 I’m guessing you find yourself in the dining room for no reason at all with a goofy smile on your face! Well done! Goodness… comment on EVERY post! I love it. 🙂 And yes… you’re fairly close in your assessment of the dining room! It really looks amazing! I am not a fan of lavender but I love it in your space. Well done! I sort of agree with you!! Until I saw some inspiration images and started to come around! Thanks for stopping by! Hi there great color, beautiful room. You did a great job is very conversation worthy and very interesting, beautiful as well. I love your room. Everything just flows together. Great Ideas. The ombre chest is the bomb! The fabric is fabulous…. I love your name too. My daughter will be having my first grandchild (a girl) and Charlotte is at the top of our…I mean their list of names! Thanks, Cheryl!! I’ve loved the name Charlotte but have my parents to thank! I think it’s making a bit of a come back so your daughter has good taste. 🙂 I met the Online Fabric girls at Haven also! They were amazing!! Oh. I forgot to mention I met the girls from Online Fabric Store at last year’s Haven Convention and they are great people to work with. I just did my living room and they were so kind and sent me a trillion samples.. This is just my kind of room. I love lavender. My maiden name is Lavender and while I hated the color when it was my name, I now LOVE it. 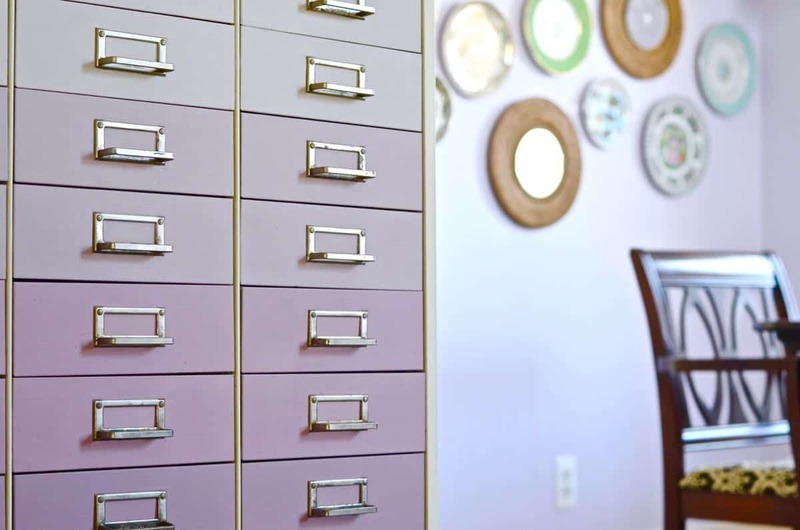 I’m interested to learn more about the file cabinet transformation. I would (almost) kill for that piece! The chairs you got from Craigslist are perfect! 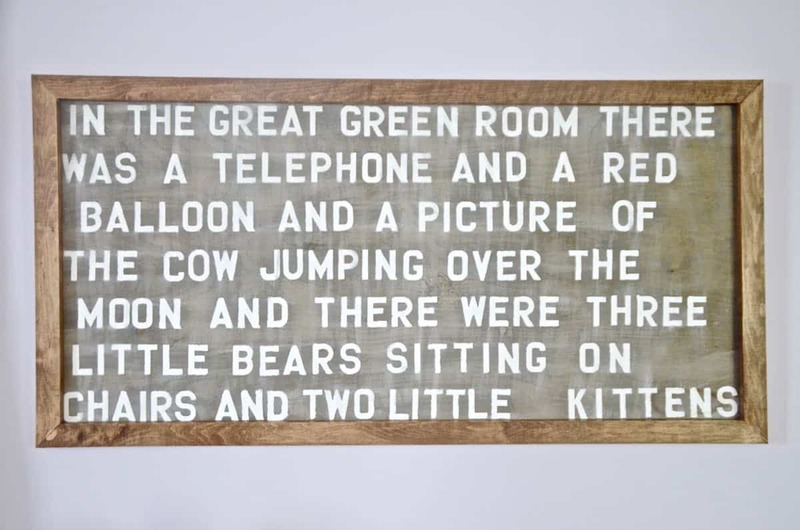 Oh yes, and the rug….. Thanks, Kathy! I will definitely update the post to show the wall color in the next few days and will make sure to mention on the ombre file cabinet post as well! Ike to make some for my patio door. 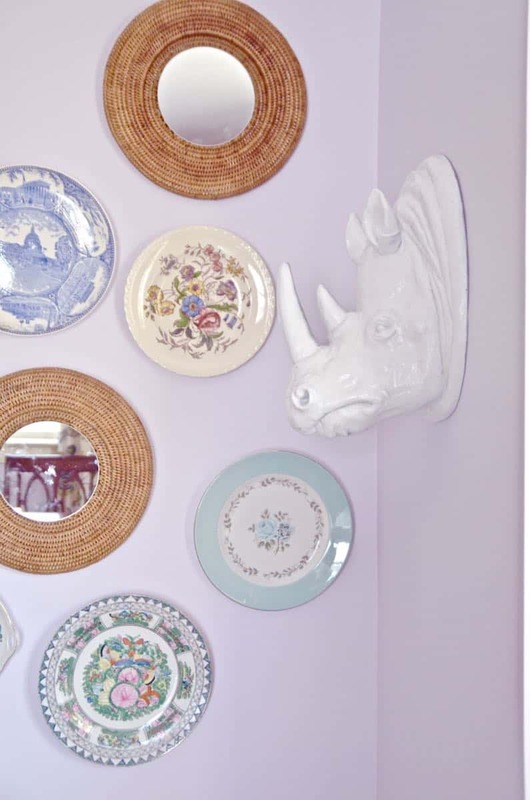 I saw the BHG article and fell in LOVE with that cabinet and would just die to have something like that in my house. I have searched your blog and must just be missing it where you posted where you got it. Can you help a girl out, please!!!! Hi Jamie, Thanks so much for coming over from BHG! 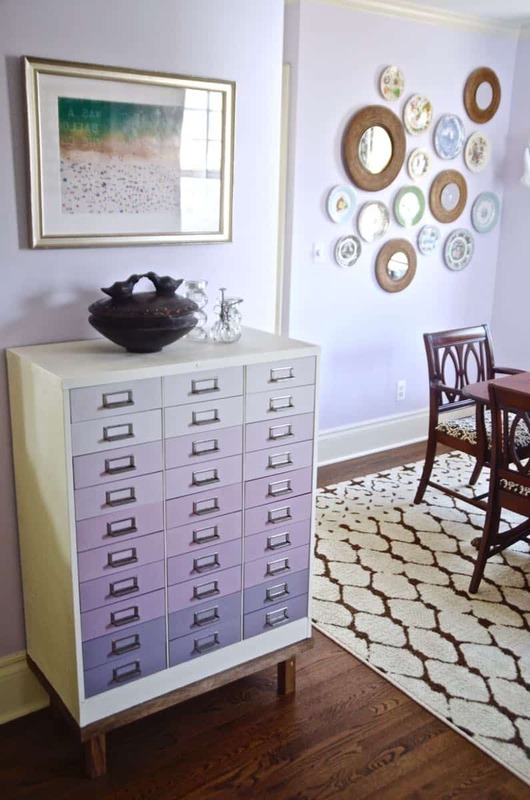 Sadly, I found that file cabinet on Craigslist and then spiffed it up with the ombre paint. I’d check your local CL, perhaps your local eBay listings and then of course any Habitat ReStores… Good luck! Hi! I LOVE your space! 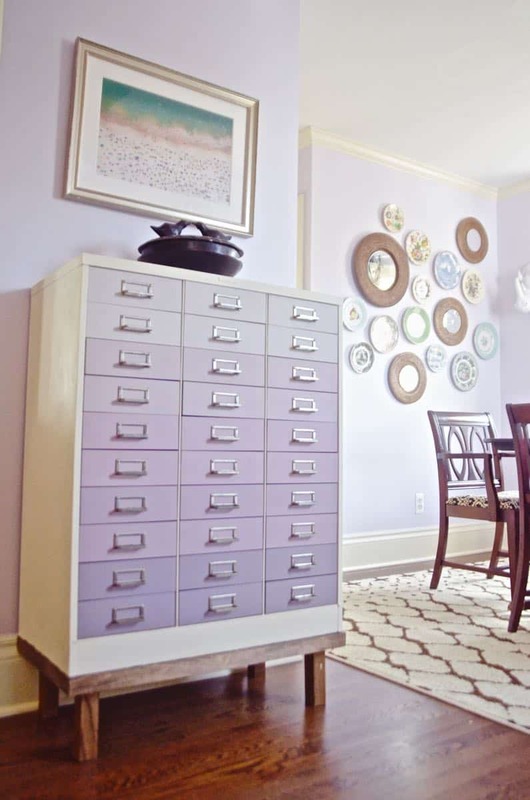 I’d like to make a cabinet just like your ombre lavender but maybe in shades of blues, or a blue, yellow, grey combo. Anyway, where did you get the file cabinet from? 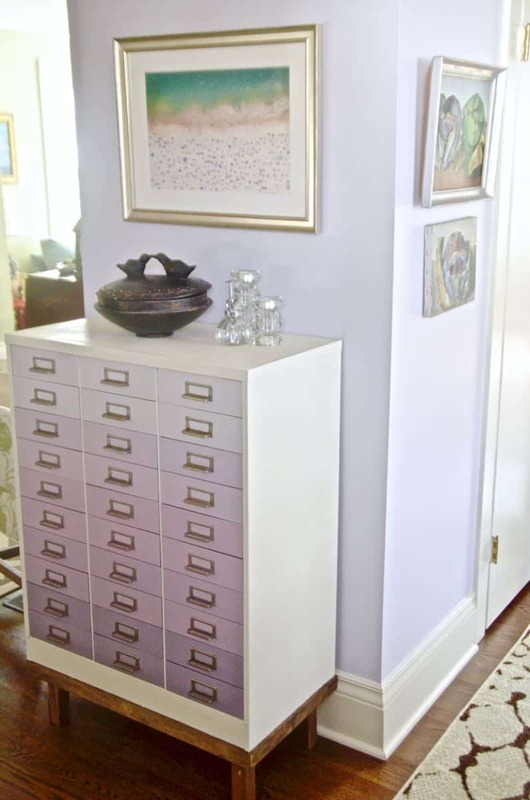 I have been looking all over and can’t find that unusual 30 drawer piece? Unfortunately, this was a Craigslist score. :/ But… I have seen them come up periodically. I’d search for “file cabinet”, “storage”, “industrial”… that sort of a thing. You can also search sites like eBay and etsy and select ‘local options’ only… might be something in your neck of the woods? Thanks for such a beautiful blog!! 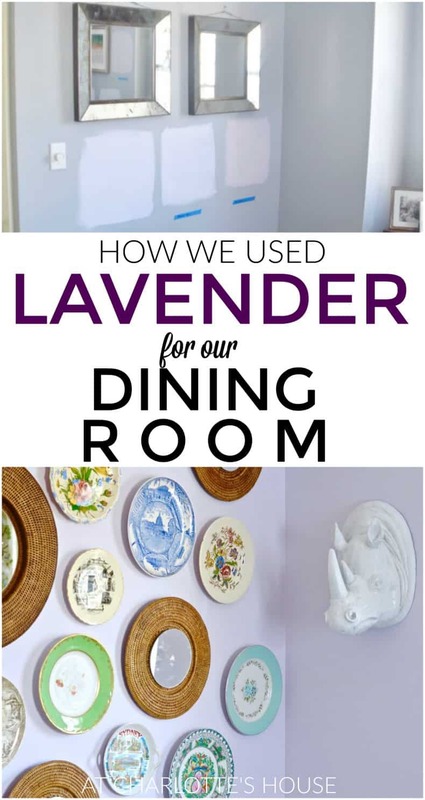 You have given me the courage to leap into painting my bedroom lavender, ‘cuz I LOVE your dining room! I, too, am working on restoring a 100 year old house, and I am looking forward to your wisdom on the subject, with a lovely dose of humor to sweeten the deal.